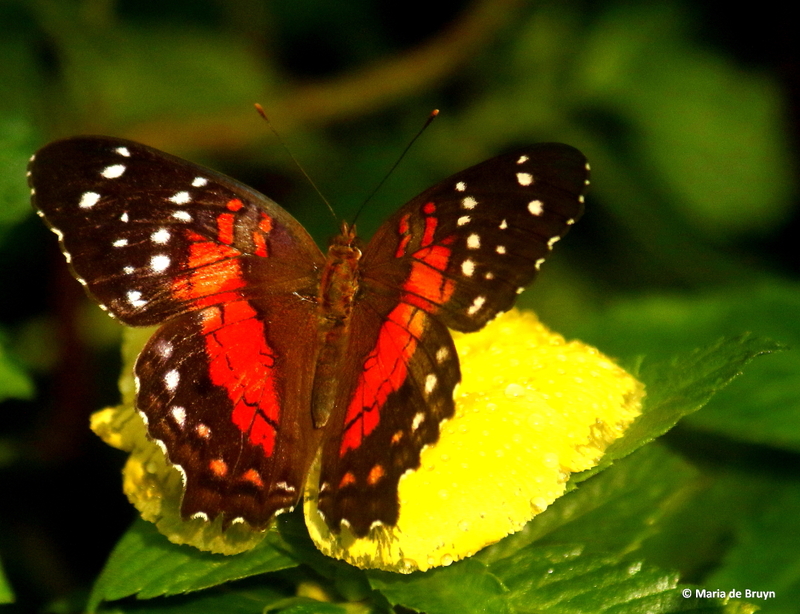 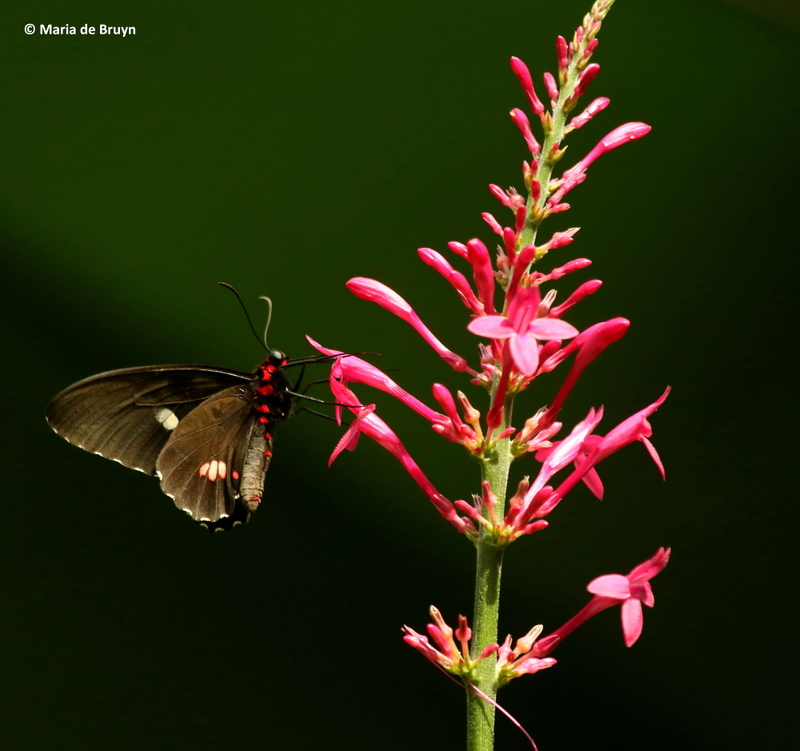 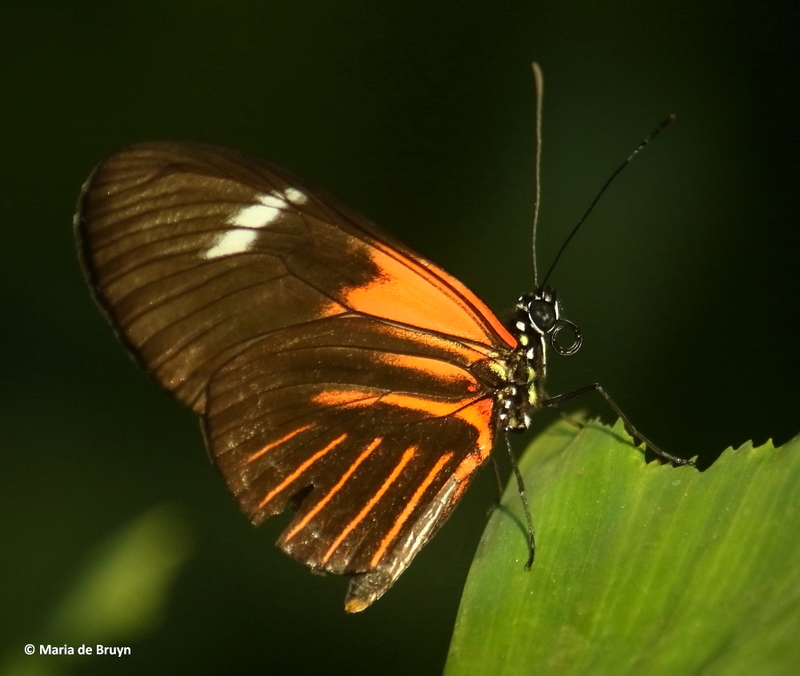 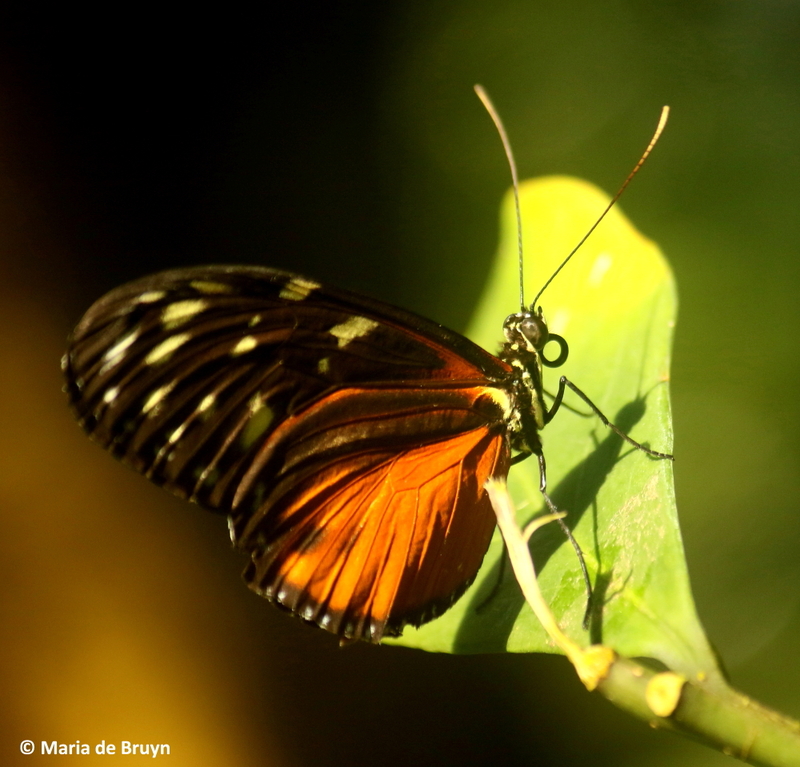 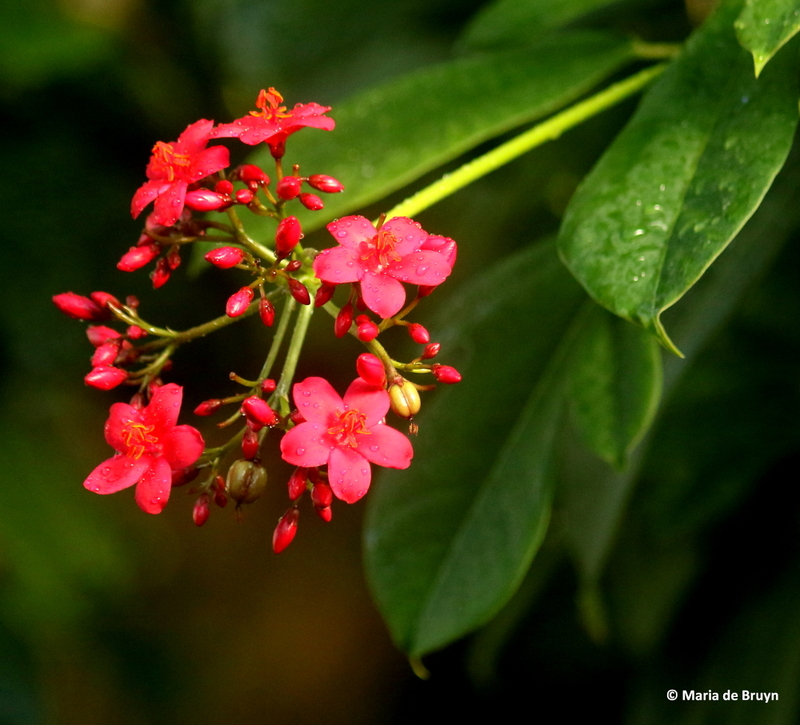 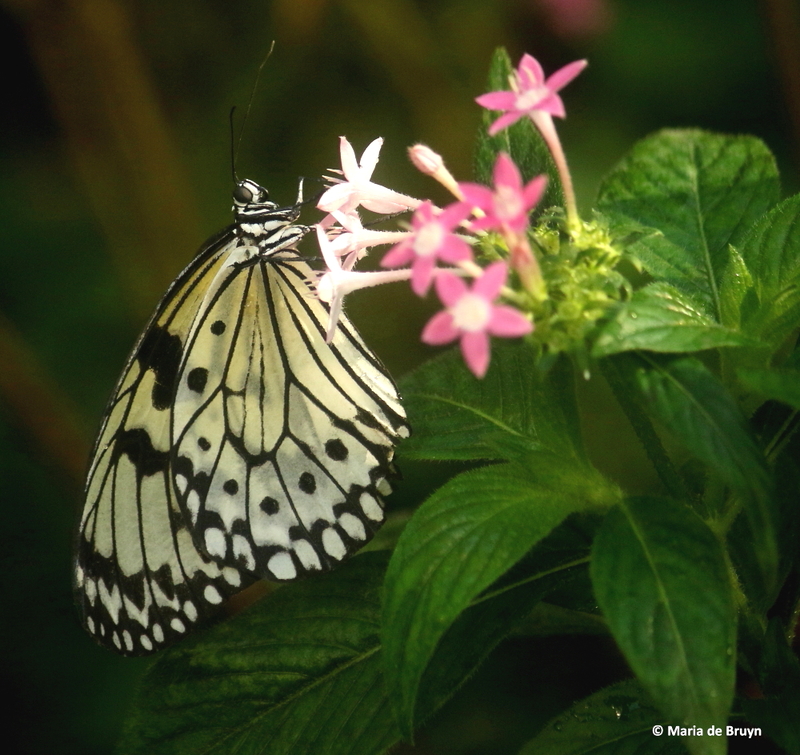 A morning at the Butterfly House – with birds, butterflies and more! 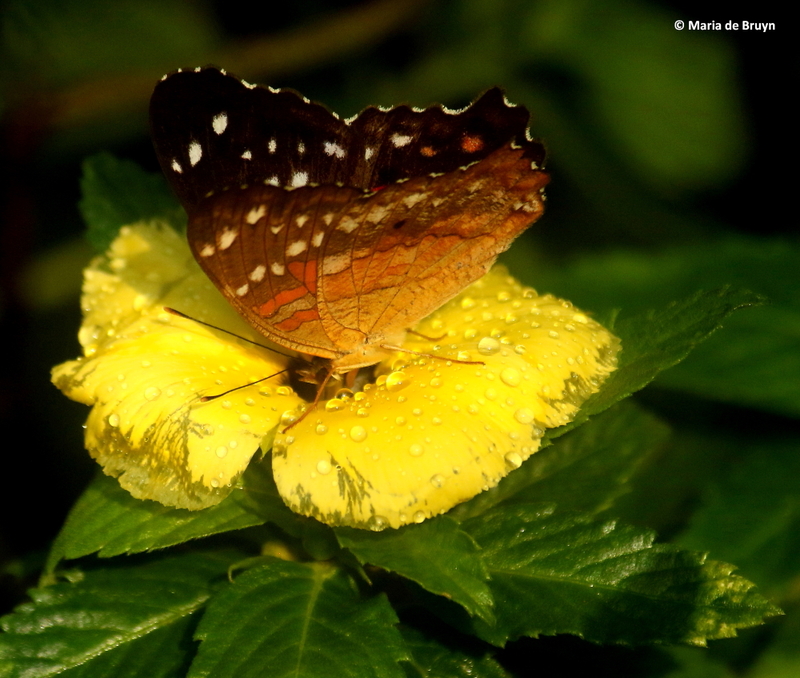 It came to me today, after spending 3.5 hours tearing out invasive plants from my yard, that one blog that doesn’t need to be postponed because I keep getting new shots to include is this one – my visit to the Durham Museum of Life and Science Butterfly House with the Carolinas’ Nature Photographers Association. 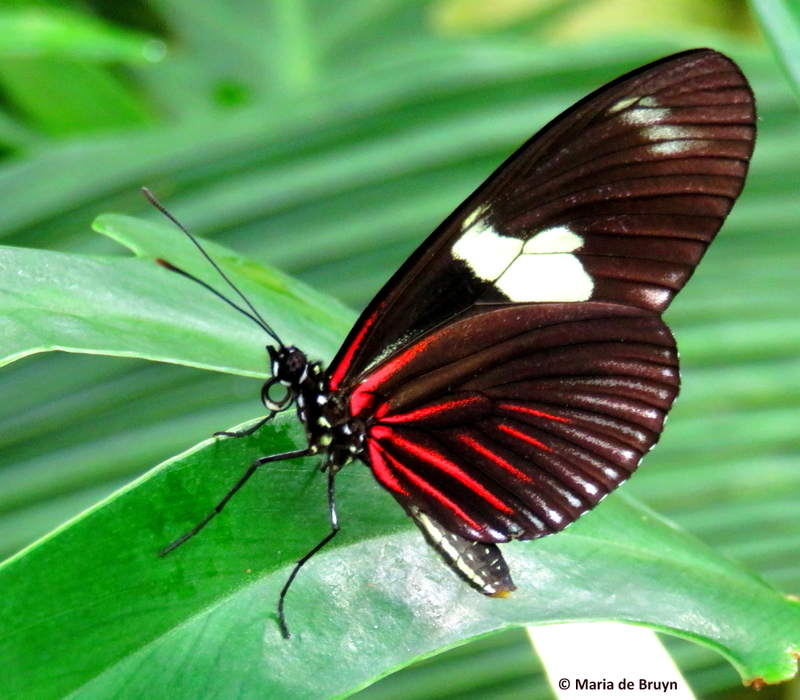 The Museum had opened the Butterfly House for the morning for our group alone so that we could take photos for several hours without people walking in front of our shots. 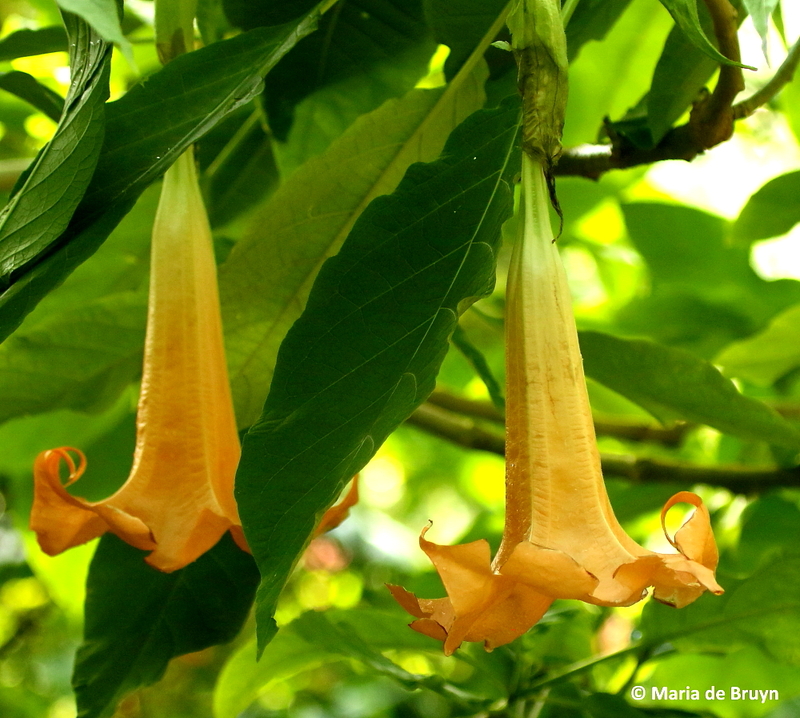 The Butterfly House is a 35-foot tall, glassed-in dome with many tropical plants such as the Angel’s Trumpet (Brugmansia). 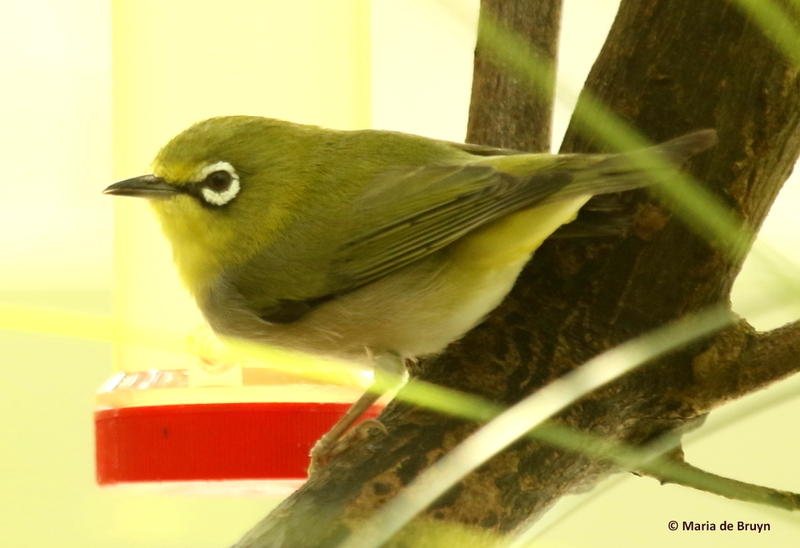 One of the four species of birds living in the conservatory, the Oriental white-eye (Zosterops palpebrosus), was enjoying a meal of tropical flowers. 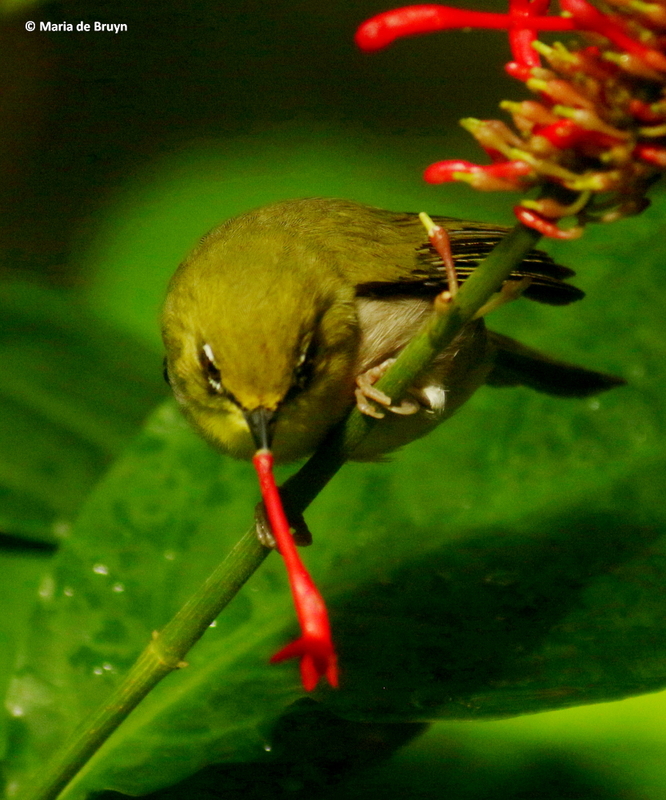 The bird would pluck a petal from the stem and then insert its beak into the base; the white-eyes have a special brush-like appendage at the end of the tongue which helps them forage for nectar and pulp. 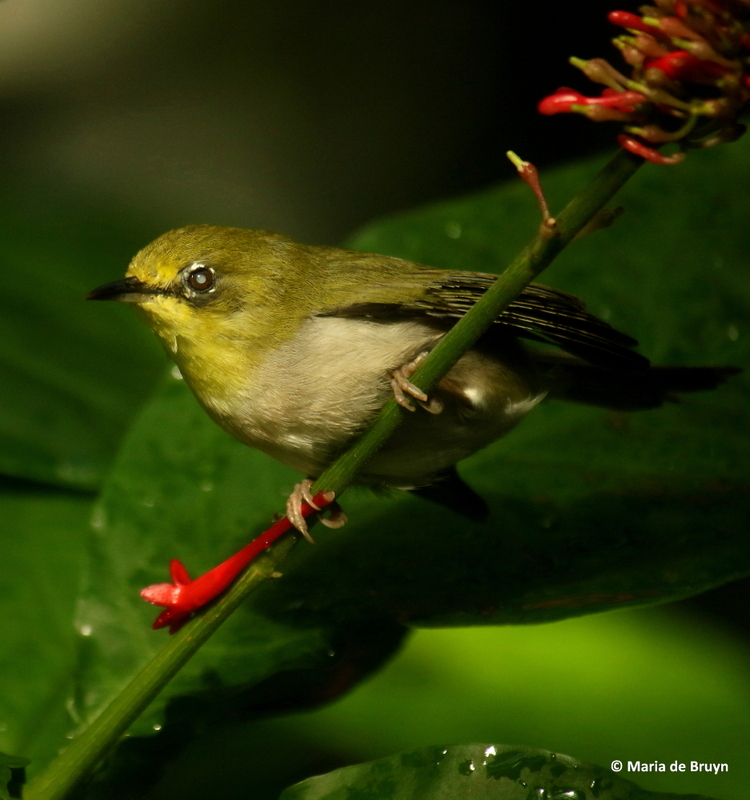 The white-eyes were brought into the conservatory to help control leaf pests and ants. 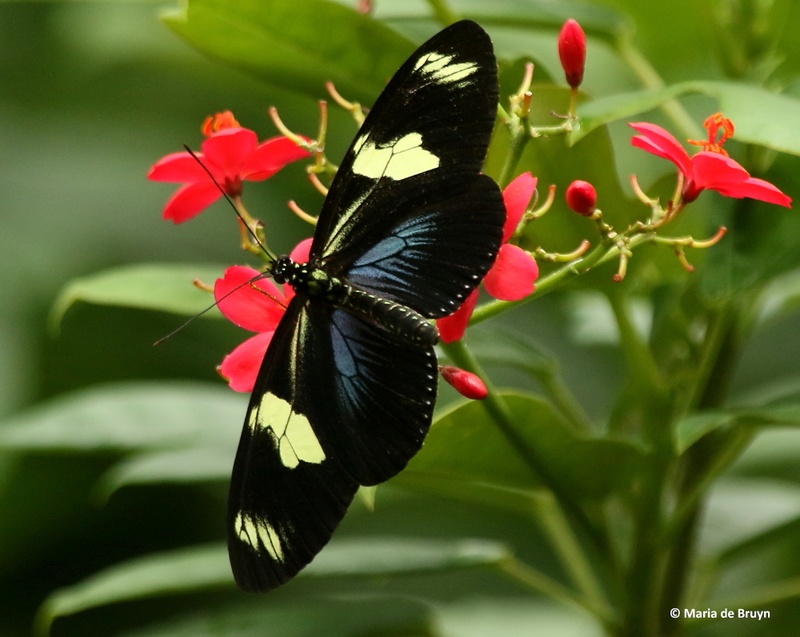 The butterflies were gorgeous and the subject of many photos in our group. 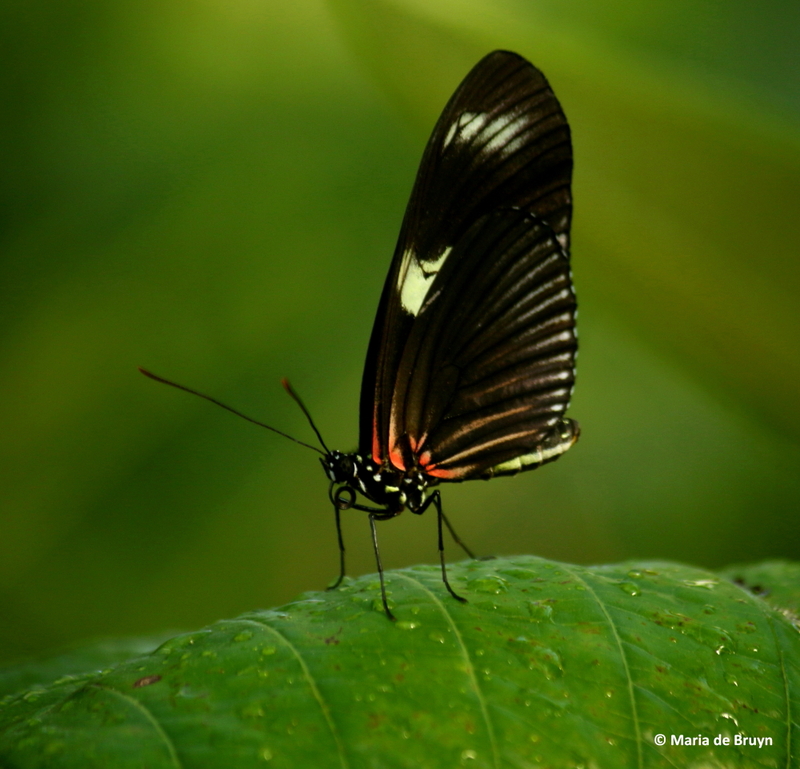 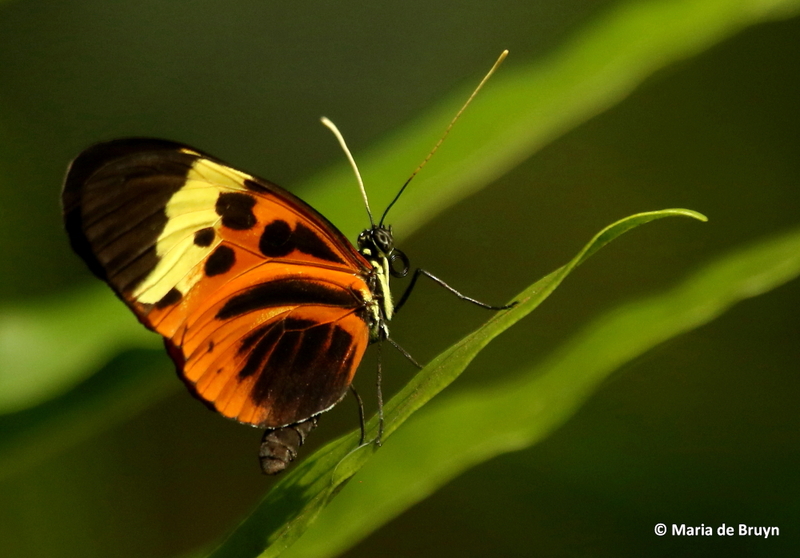 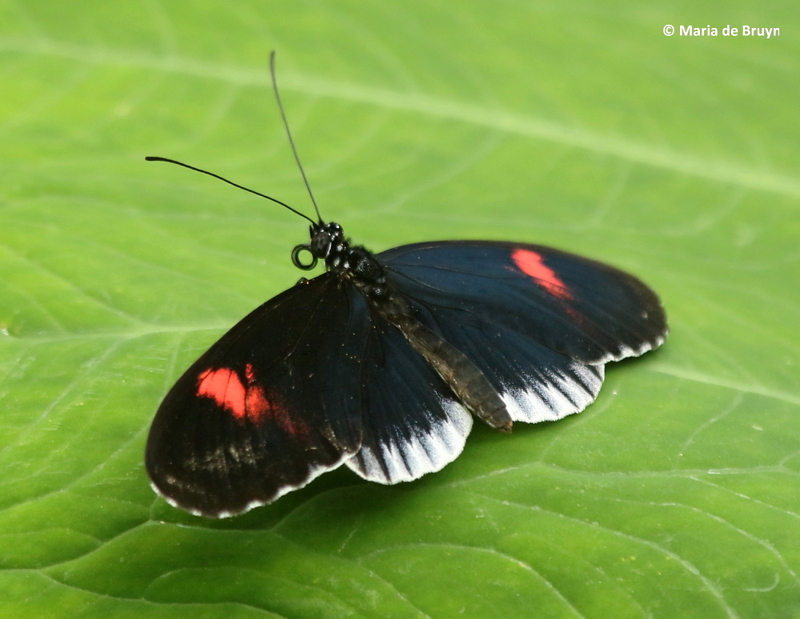 The postman butterflies have variations within a species. 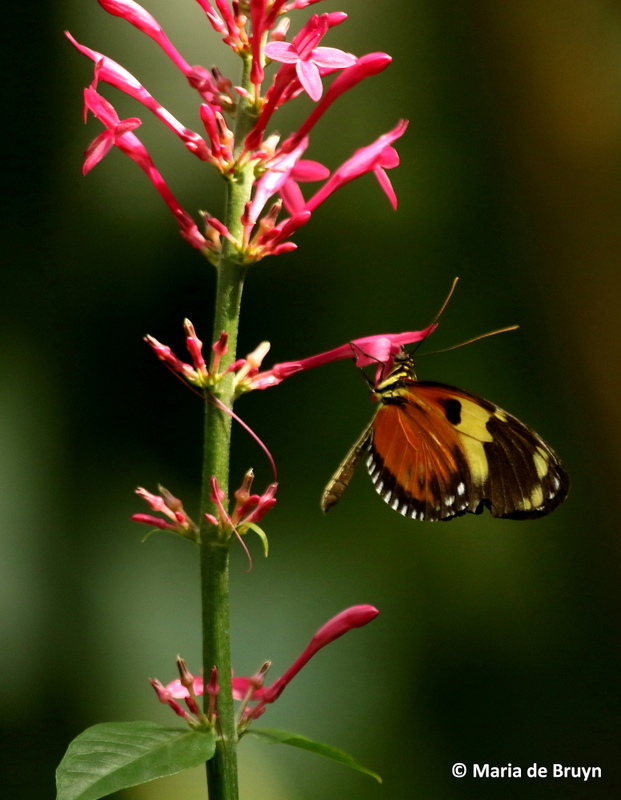 Another group were the longwing butterflies. 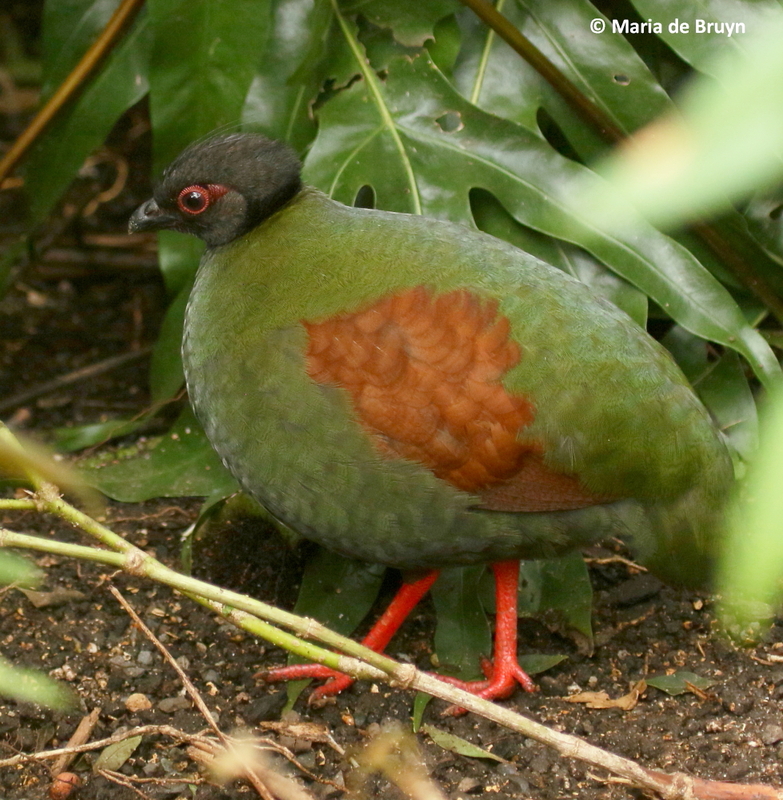 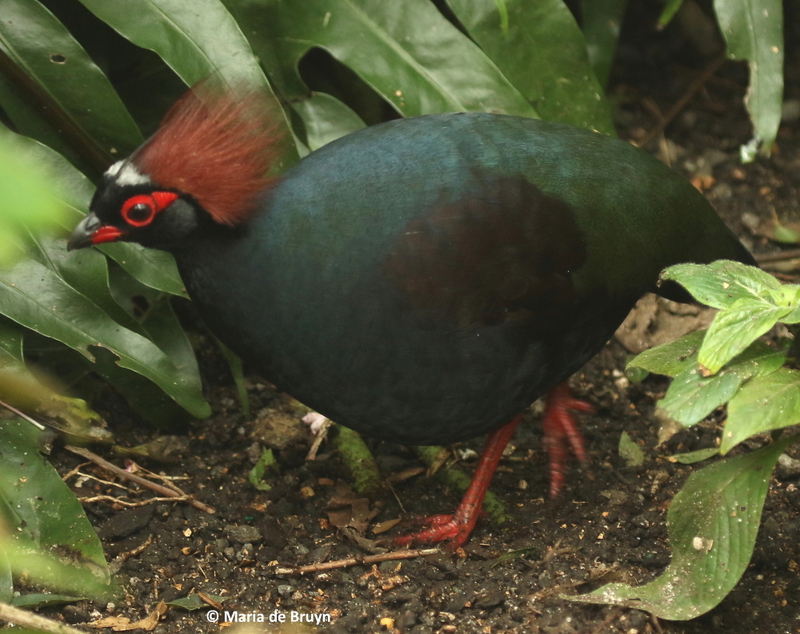 As we looked at the butterflies that landed low on flowers, we were able to see the Crested wood partridges (Rollulus roulroul) that are endemic to Asia. 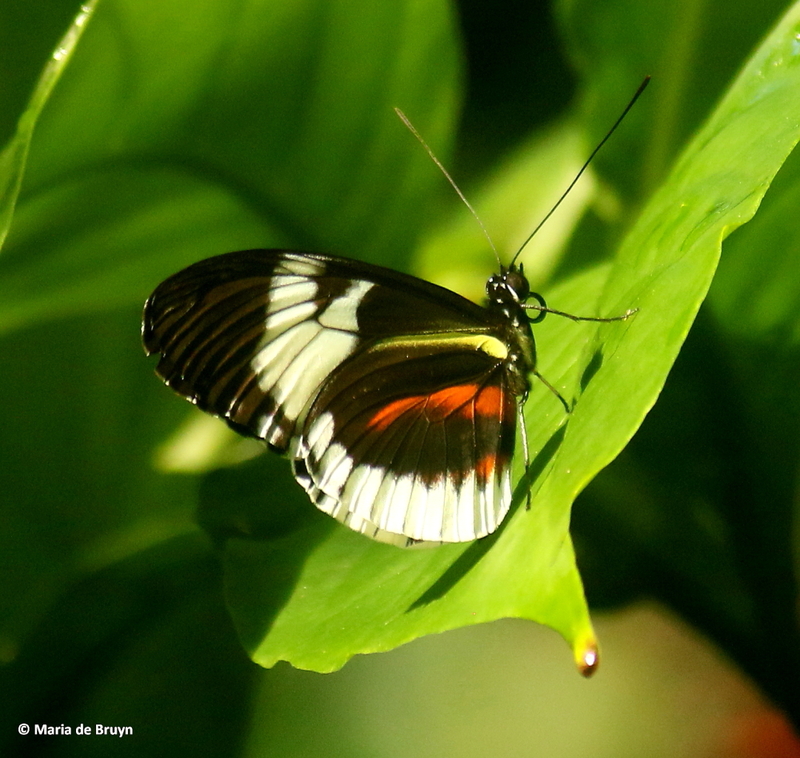 They breed in the conservatory, laying their eggs behind dense shrubs, and they help control soil pests in the Butterfly House. 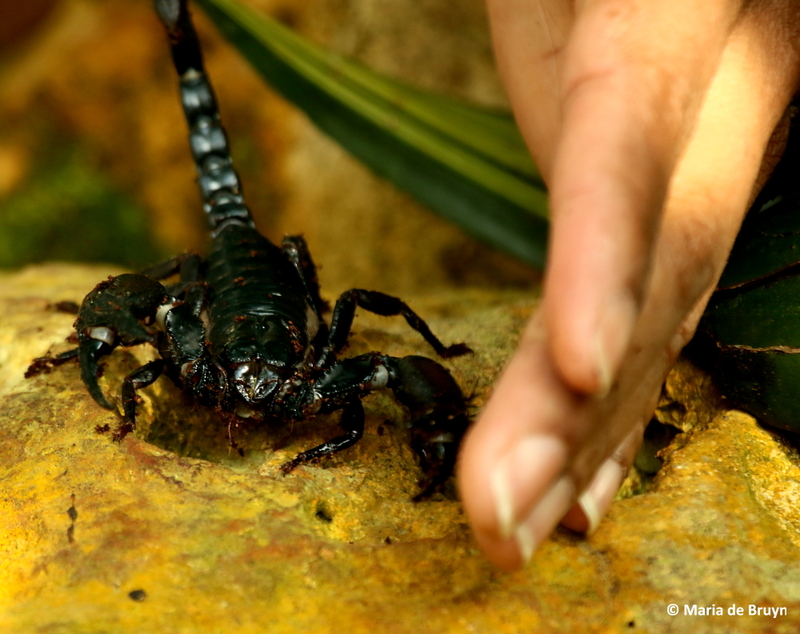 At one point, a museum staff-member brought us a group of insects to see up close. 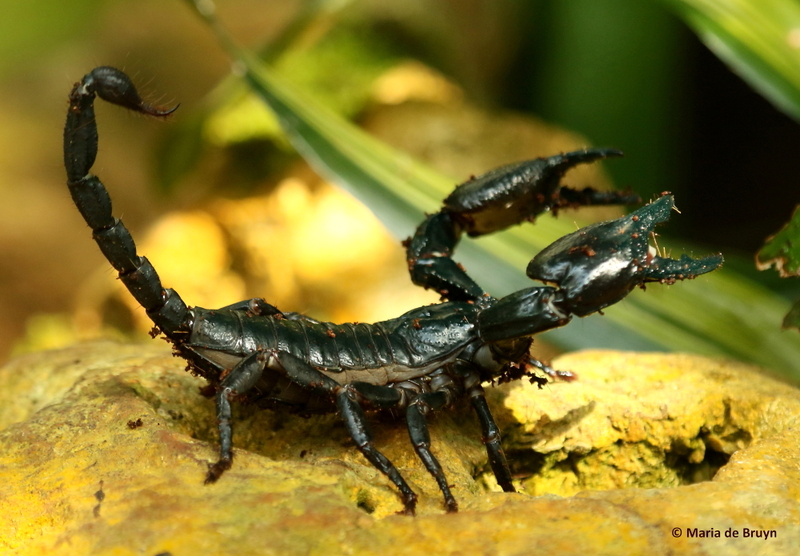 One of them, I certainly would not have touched, although it was fascinating to watch: the Asian forest scorpion (Heterometrus). 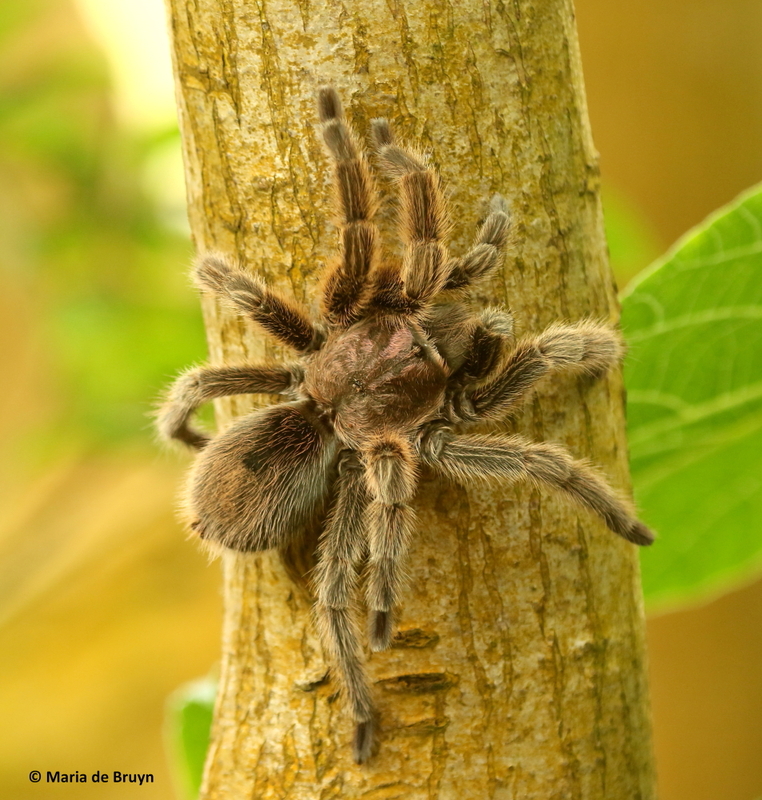 The Chilean rose tarantula (Grammaostola rosea) was a really beautiful tarantula that blended in well with the tree against which it was placed. 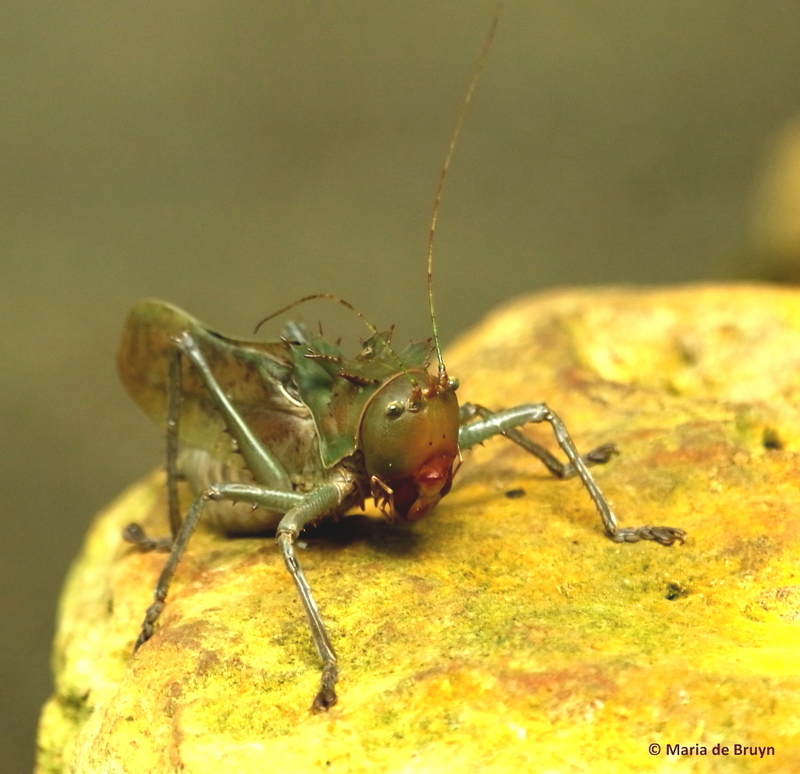 The dragon-headed katydid (Eumegalodon blanchardi) was an interesting creature. 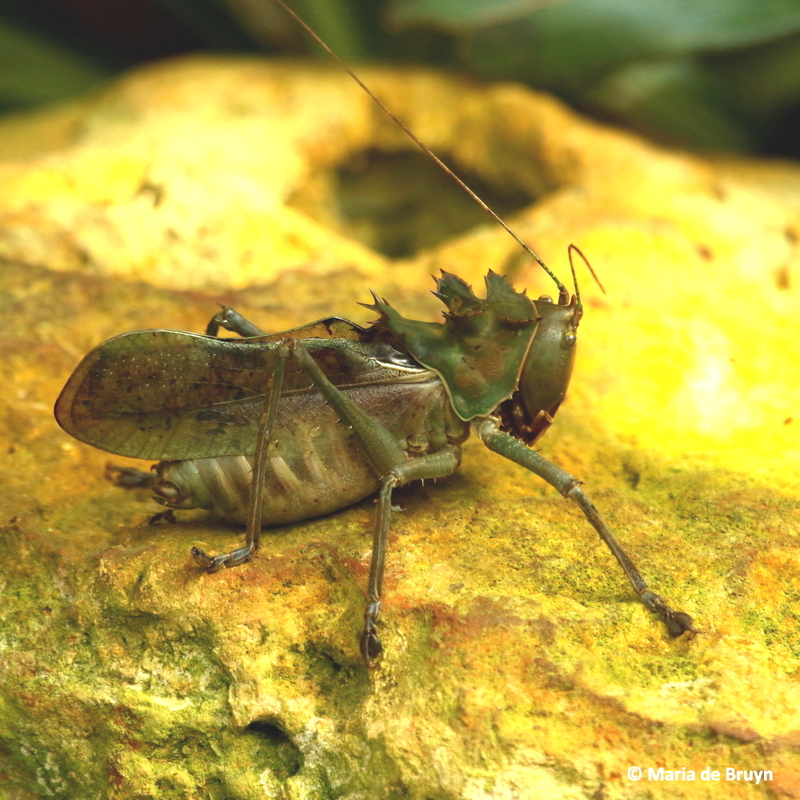 I do think its head looks more like a horseshoe crab, though! 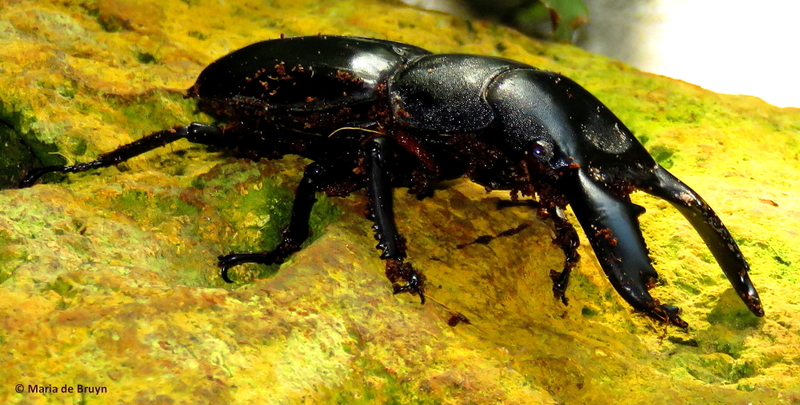 The rhinoceros beetle was nice and shiny – I once saw a young boy in Thailand who had one as a pet; he was taking it for a walk in the forest and it looked to be about as big as his hand. 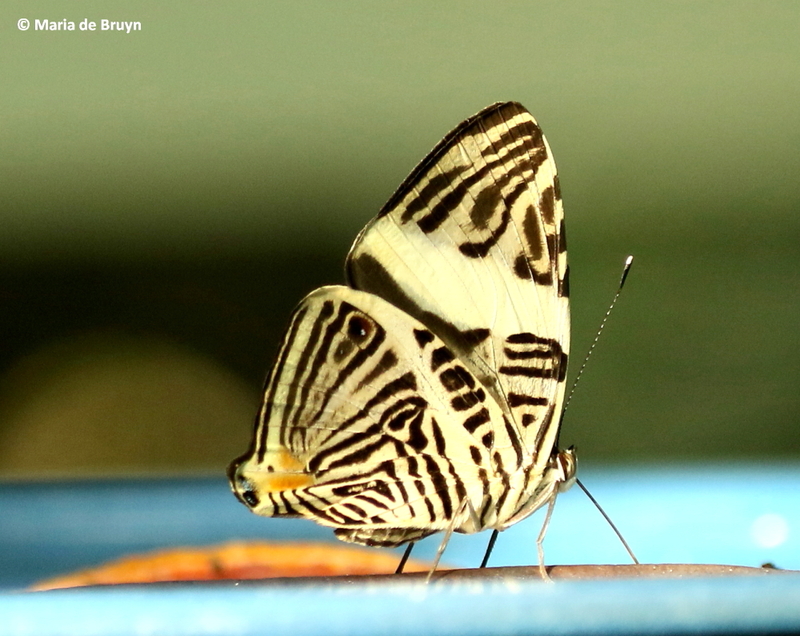 It’s interesting how the patterns on the dorsal and ventral sides of a butterfly can be so very different – you may need to look up both sides to get a good ID of the species. 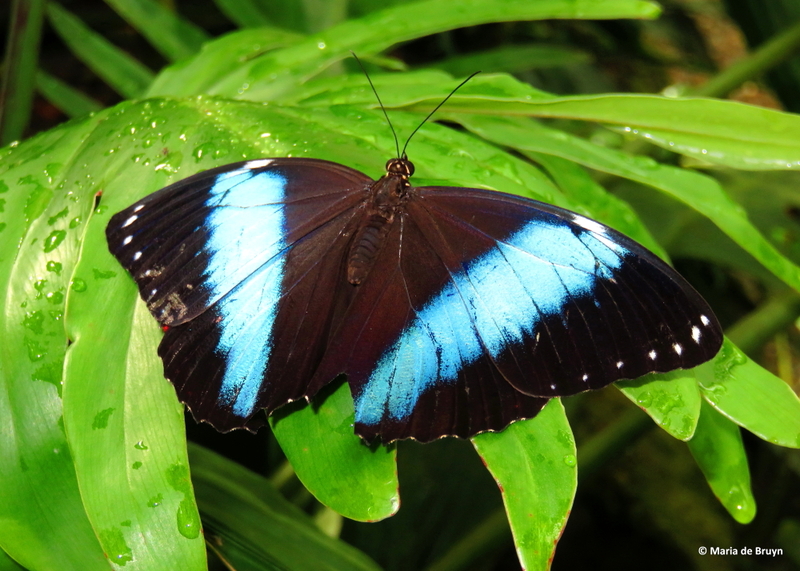 This is especially true of the Blue morpho (Morpho peleides). 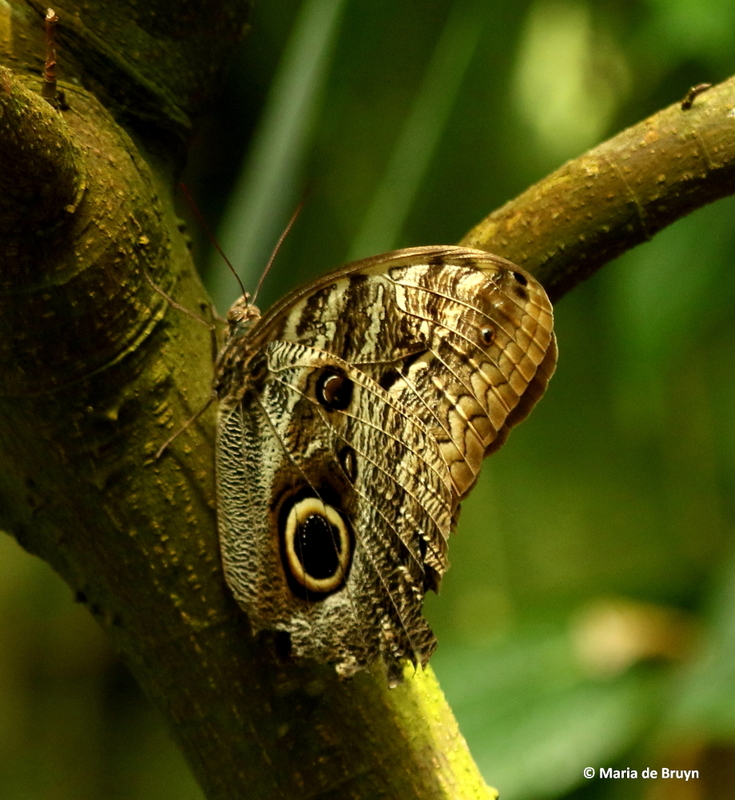 The female shows similarities in her dorsal and ventral wings. 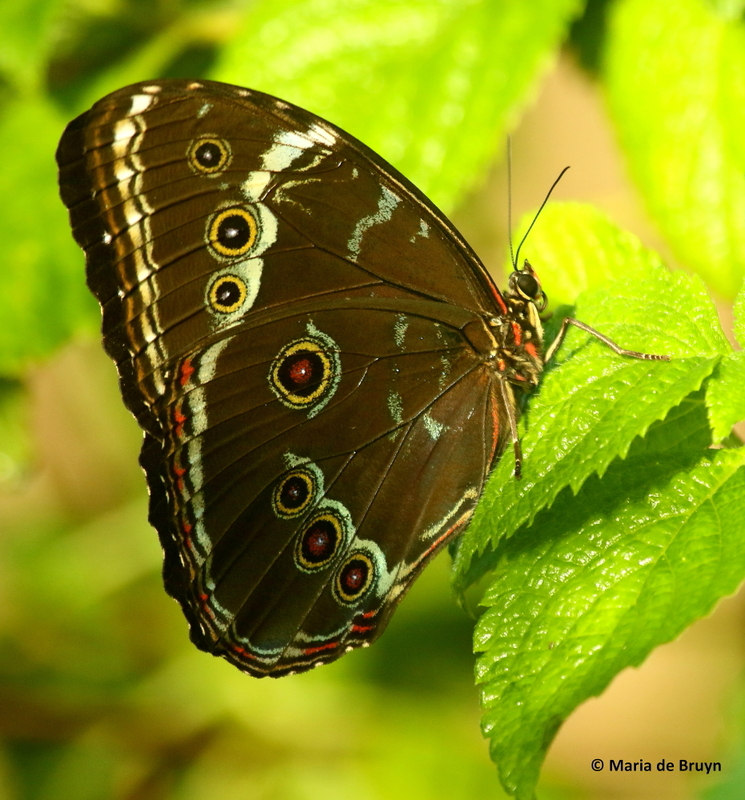 The owl butterfly (Caligo memnon) was an impressively large individual. 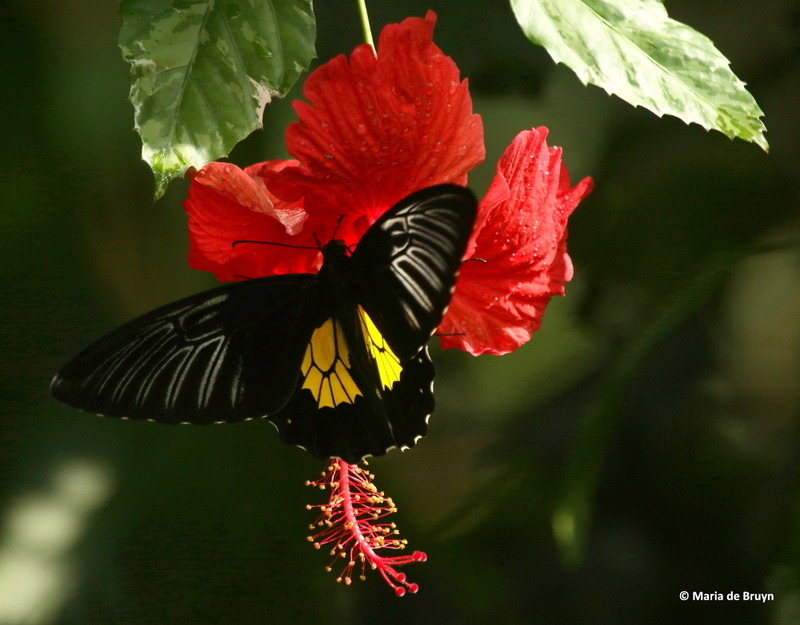 The Malayan birdwing (Troides amphrysus) spent much of its time huddled up against the windows but I was able to catch it on a flower. 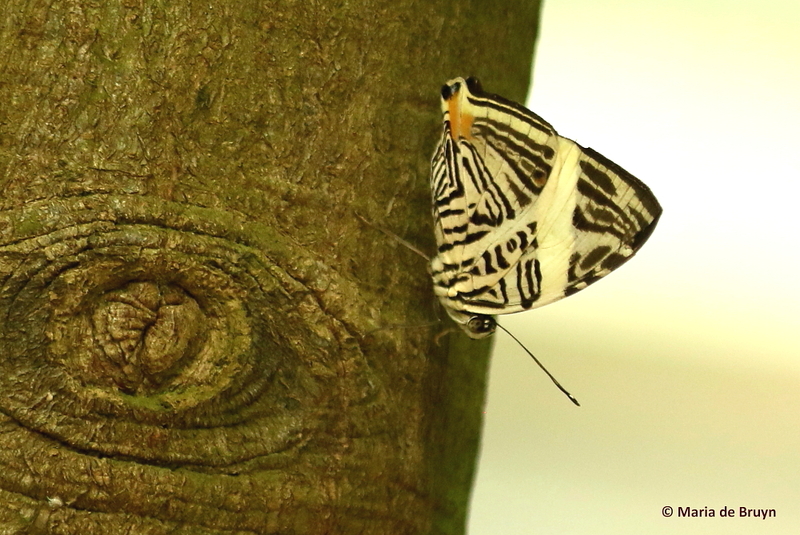 Two kinds of black-and-white butterflies were fluttering about, the Asian paper kite (Idea leuconoe) and the zebra mosaic (Colobura dirce) from Central and South America. 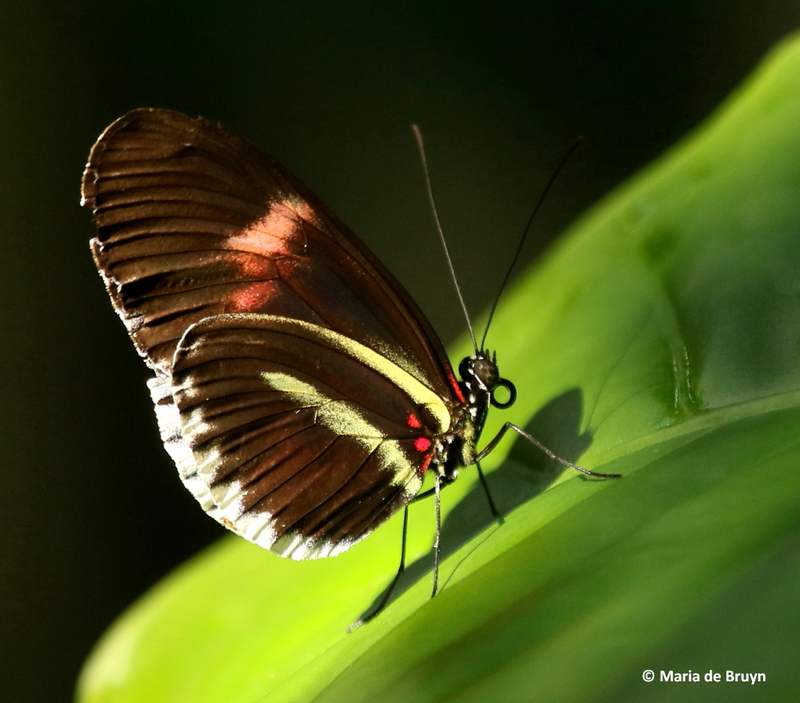 There is a glass case in the conservatory that has lines of chrysalids hanging on wires. 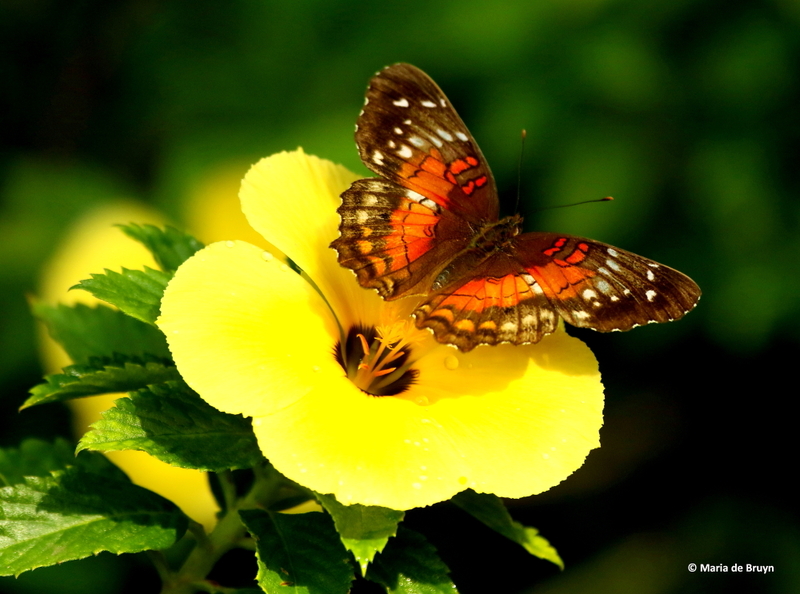 At any time, you may see one or several butterflies that have just emerged and are unfolding and drying their wings. 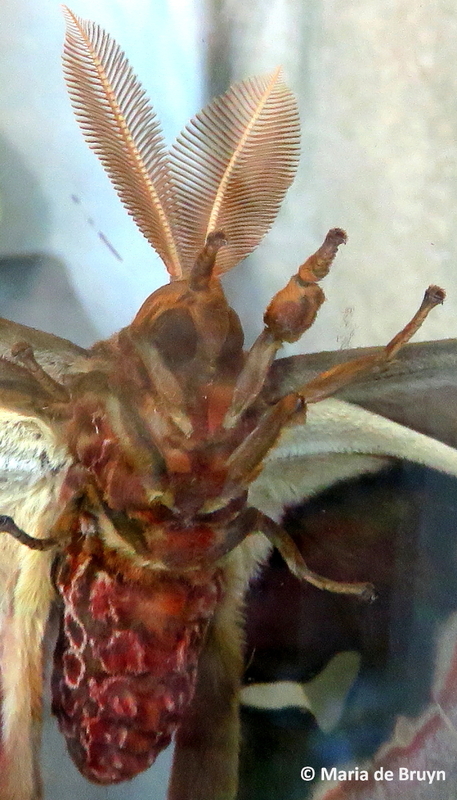 This individual was perched against the glass for the unfurling, giving an excellent view of beautiful feathery antennae. 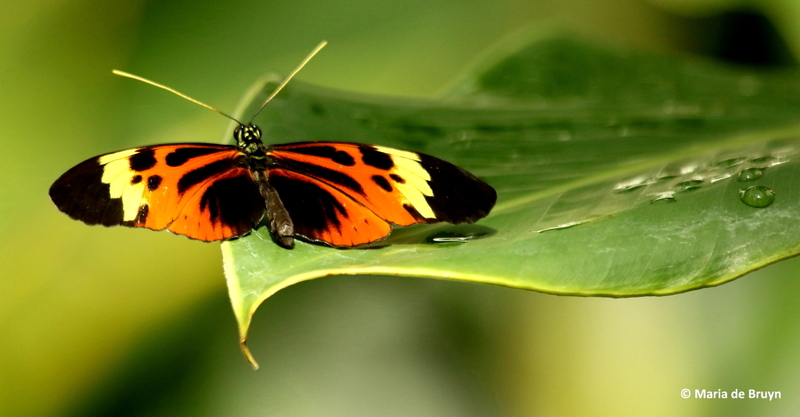 There were two more birds in the Butterfly House that were beautiful to see. 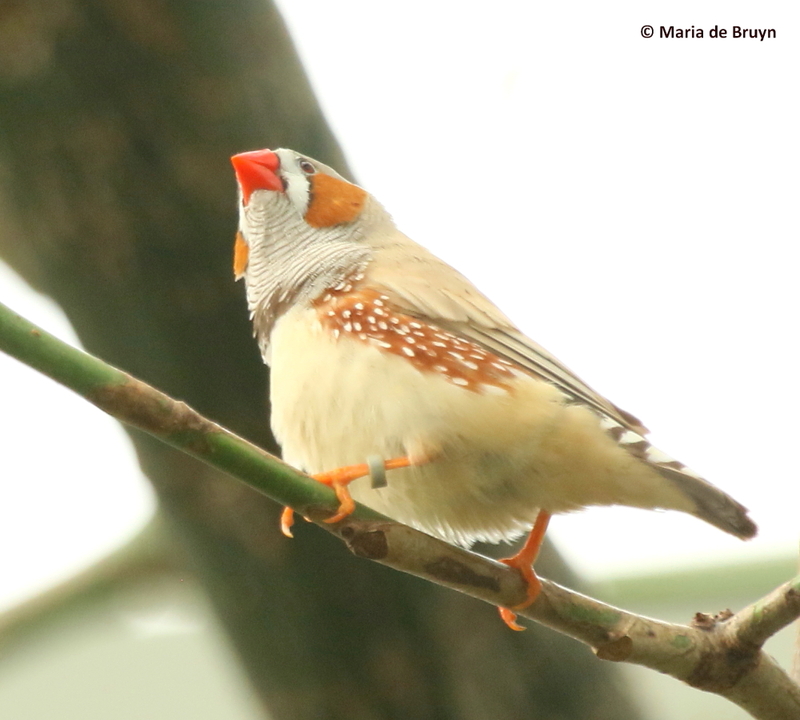 Both from Australia, the zebra finch (Taeniopygia guttata) was difficult to photograph as it spent a lot of time very high up in the dome. 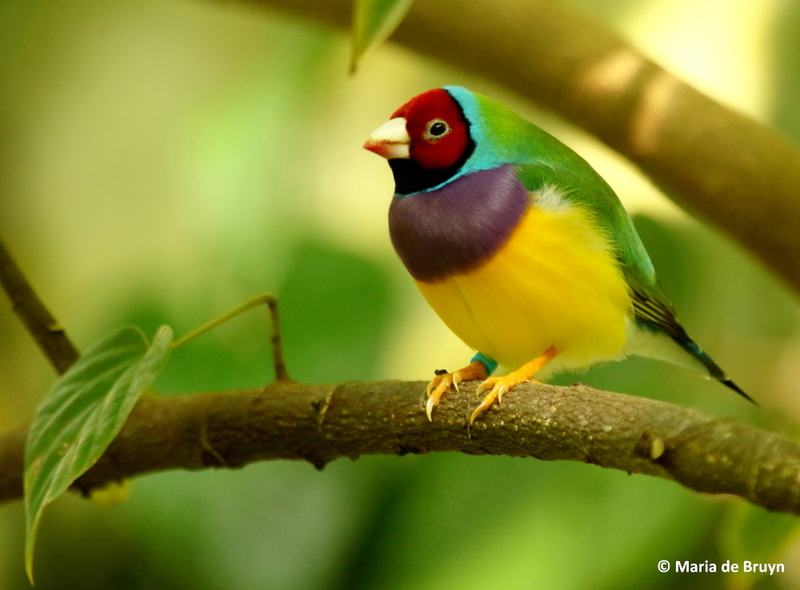 The most beautiful – to me – was the Gouldian finch (Erythrura gouldiae). 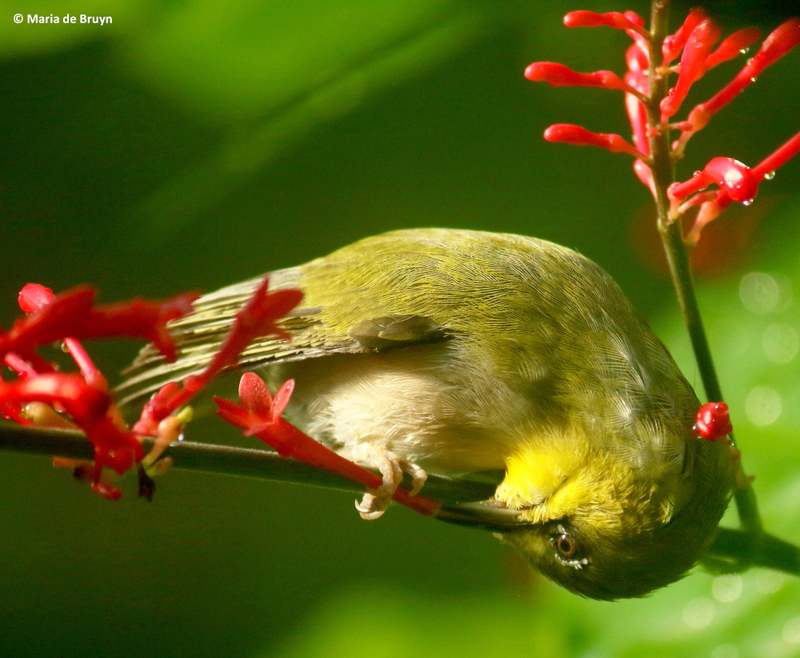 The colors are a bit like the American painted bunting but they look as if they were put on in blocks of color like a kind of avian Mondriaan painting. 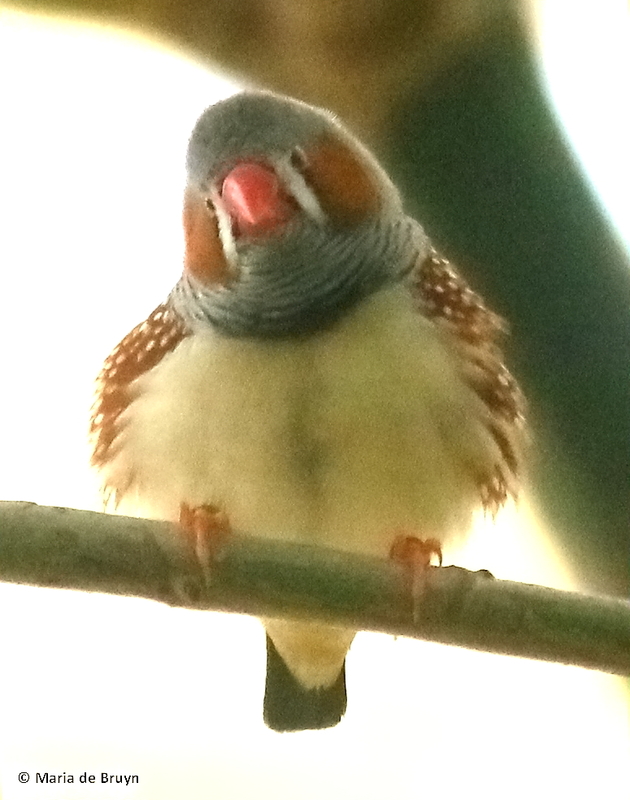 I followed this bird around several times in the hopes of getting some nice photos and finally succeeded in my opinion. 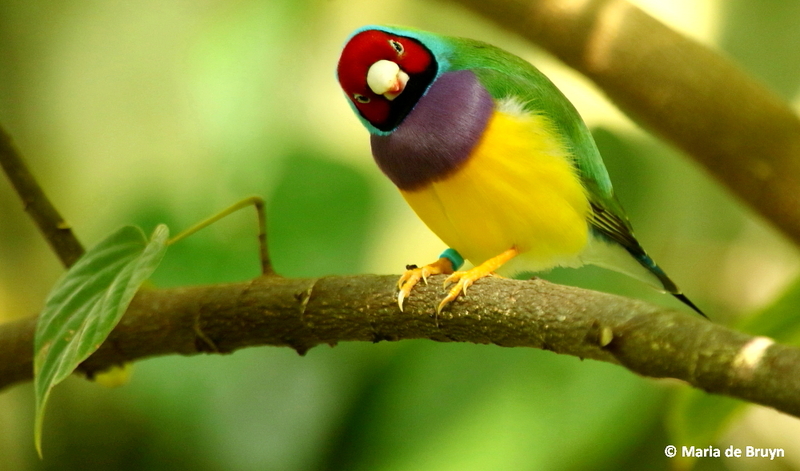 I’d love to have this bird coming to my feeders!